Congratulations to all Skippers and their Crew for a wonderful sail racing season. On Friday, September 15th, we held our Fall Dinner and Annual Member meeting at the Horseshoe Bay Beach Club. It was a perfect evening - delicious food, wonderful company, and a great way to end our 2017 boating season. The Commodore's Outstanding Service Award was given to both Lucy & Karl Klug and Sue & Jack Whittemore in appreciation of their many years of dedication and service to the Egg Harbor Yacht Club. Enjoy the photos to the right! Our Annual 'Women at the Helm Race' was held on Saturday, August 5th. It was a fun afternoon with fair winds. Coleen Ulrich and her crew on Salem Witch took first place with Captain Marty Moravec on Rainbow's End coming in second. Third place went to Jackie Ritchie and her crew on Blue Run. Sixteen year old Alex Rapp earned the 'Young Skipper Award.' Shawn Mathys on Mariah received the Helmswoman Award and Gwen Porter on Sabbatical earned the Yachtswoman Award. Congratulations to all these Skippers and their crew. The Southern Florida Gathering was held on February 15th at the home of members, John and Joyce Protz. 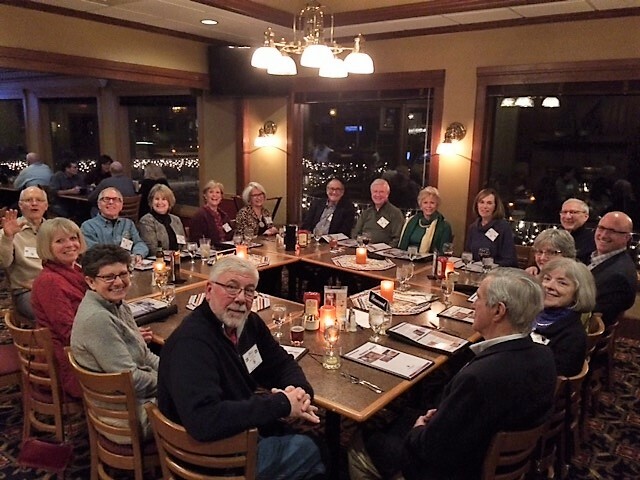 It was very well-attended and all present enjoyed great food and had fun reconnecting with other members. On April 28th, eleven EHYC members were able to gather at BICE on 5th Avenue in Naples for a final Southwest Florida Gathering before everyone travels north to Door County. Looking forward to a wonderful summer! ​The Door County Winter Gathering was held on Saturday, January 21, at the Landmark Resort in Egg Harbor. The food was delicious and all able to attend had a wonderful time. Great weekend for our second sail race of the summer and our Hawaiian themed Dockside Saturday Gathering! Salem Witch came in first with Rainbow's End and 007 close behind!